Michael Posner and Ling Liau dance the Paso Doble on their way to placing second in the International Latin event at the second annual MIT Open Ballroom Dance Competition. The competition was held over the weekend in duPont Gymnasium. Mike Parkins '99 leaps into the water jump on his way to first place in the steeplechase at Sturday's track meet. Steven M. Casey G and Diedre Pierotti strut on the way to the finals of the Open International Rhumba at this weekend's MIT Open Ballroom Competition. 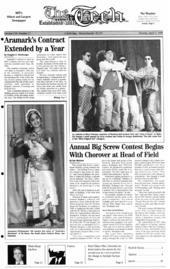 Anupama Pillalamarri '00 relates the story of "Gajendra Moksham" at Ek Nazar, the South Asian Cultural Show, last Saturday. Mary L. Krasonvic G (far left), Nicole Y. Morgan G (middle), and Alisha Sieminson '98 (far right) perform in "Box," a dance choreographed by Sieminson and preformed at Dance Troupe's Signature concert this weekend. Simo Kamppari '98 spikes the ball in the first round of Saturday's 3-on-3 coed volleyball tournament in Rockwell Cage. Kamppori, Alarice Huang '00, and Robert Moser '99 went on to win the tourney, which was staged to raise money for the women's volleyball team. Sandra W. Chan '98 plays Rose Alvarez, a.k.a. "Spanish Rose," as she tries to seduce Maude, played by John A. Miller '98, in the Next House production "Bye Bye Birdie." Kara S. Meredith '00 plays Sporty Spice for the song "Wannabe." The Alpha Chi Omega pledge class of 1994 open the evening with "The Full Monty." Sigma Nu acts out a scene in "Desperado." Robert D. Lentz '98 of Phi Sigma Kappa portrays President Clinton in "The State of the Union." With him are Sumit Agarwal '98 as Hillary, Benjamin J. Moeller '99 as Chelsea, and David T. Tin '99 as Socks the cat.